Wilcox County High School in Rochelle Georgia about 50 miles outside of Macon will have its first integreted prom this year. Yes you read that right. In 2013 Wilcox High will integrated its prom. But Homecoming will still be segregated. 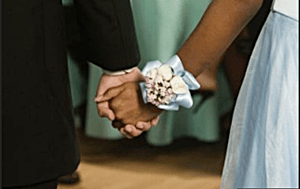 There’s a white prom and then we have our integrated prom,” said student Keela Bloodworth. Keela added that if any race other than Caucasian tries to attend the white prom, that student would probably be escorted off the premises by police. That was the case last year when a biracial student was turned away by police. While having two separate dances, the school decided to elect only one pair for Homecoming king and queen for the first last year. “I felt like there had to be a change because for me to be a black person and the king to be a white person, I felt like, you know why can’t we come together,” said Wallace. But nothing changed. Quanesha wasn’t invited to the white Homecoming dance. In fact, the pair took separate photos for the school yearbook. We’re embarrassed, it’s embarrassing,” said student Stephanie Sinnot. But, not everyone is fond of the idea. Some of the posters for the integrated prom that were hung up have been ripped to the ground. I am INCENSED. If it had read this on Monday, I would have thought it was an April Fool’s joke. OK, so when I read it was an integrated prom and my first thought was it was including both straight and gay students. Well imagine my shock when I realized it meant they were including whites and African Americans. I consider myself fairly well informed and although I don’t live in the US I am right next door in Canada and I can’t believe segregation still openly occurs. I have always thought that some people are racists and will never change but I am shocked that a school gets away whit this. Nothing for these people to be proud of that’s for sure. Hopefully some day soon they will come out of the early 20th century and join us here in the 21st. I hope no one goes to the segregated prom.